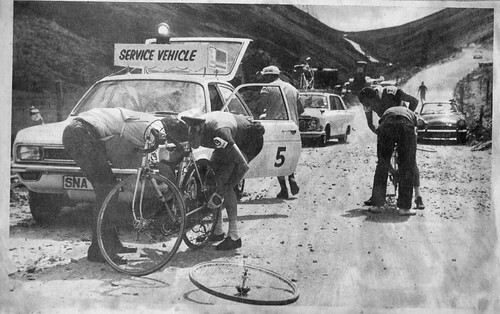 Kindly uploaded by David Martin, a fairly regular contributor to this blog, comes this photo from the 1971 Scottish Tour of the Grampians Milk Race. Note the dirt road – if anyone knows where this road is, please post in the comments. A web search for this event revealed that there a race manuals was for sale on eBay pretty cheap- so for the history buffs the info is still available if you can find it. David referred to this as a Milk Race but on Braveheart forum Steven McGinty recalled that it was sponsored by Sunblest and christened “The Piece Race”. Again the race manual would clear this up but if you remember more info, please post up a comment. Rider 27, who is receiving service in the right of shot, is Phil Templeton of Dundee Thistle RC. Incidentally, I was looking at another of David’s photos from the 2011 Snow Roads Auduax today, which also features Phil Templeton. 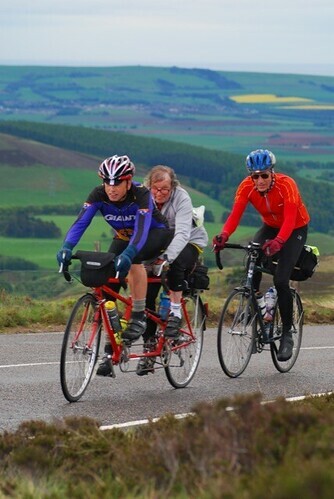 He is seen below piloting a tandem on the Cairn O’Mount, with legendary long distance rider George Berwick. In the above shot, Phil and George are riding the Snow Roads Audax is a 300km/186 mile ride also held in the Grampians, taking place this weekend. With 4800m/15,750ft of climbing, taking in the Cairn o’Mount, the Cabrach, the Lecht, and Cairnwell, it is probably one of the toughest rides in the UK. And the best value, with the cost to enter a mere £8.00. Bring your own food though! Rider 19 in the top photo, receiving wheel service on the left is I Thompson of ‘Glasgow B’. David informed me that there were centre teams, and National Teams as well, in this race. Another race taking in dirt roads is the South Carrick Davie Bell. Traditionally one of the toughest one-day road races in Scotland, last year Ayr Roads brought in sections of dirt road to honour the pioneering highwayman that the event is named after. The event has stepped up to National A status this year, with a high quality start sheet littered with pros and elite riders who will do battle on 10th June. Unfortunately the dirt sections will not feature in 2012 due to road repairs but we are sure they will be back, and in future the event is seeking to achieve Premier Calendar status. 2012 features 100 miles of racing, nearly 7,000ft/2369m of climbing, several passes through Girvan and the Nic o’ the Balloch climb. This entry was posted in Cycling history and tagged amateur racing, touring on June 1, 2012 by Owen.